This bench is the result of several intergenerational storytelling gatherings involving local Girl Scout troops, residents of Croixdale, a senior living center, and artist Judy Sell. From Stillwater: Hwy 95 south 3 miles to Croixdale, on west side of the road, across from Andersen Windows plant. Bench is at the main entrance. Two generations came together in Bayport to make an Art Bench and a lot of memories. A group of Girl Scouts worked with the senior residents of the Croixdale community and a Stillwater artist to design and build the colorful, welcoming place to sit. Vern and Edie Hophan, two Croixdale residents, were very active in the project. They say working with the Girl Scouts was special. The bench’s title, Kindness is Key, reflects the good feelings that came from the project. Artist Judy Sell led the creation, and explained how the bench lived up to its name. “Everyone was being so kind to each other. The whole thing was so incredibly peaceful and friendly,” Sell says. The collaboration began in earnest when the Croixdale residents and Girl Scouts participated in a storytelling and drawing exercise led by artist Sue Rowe. 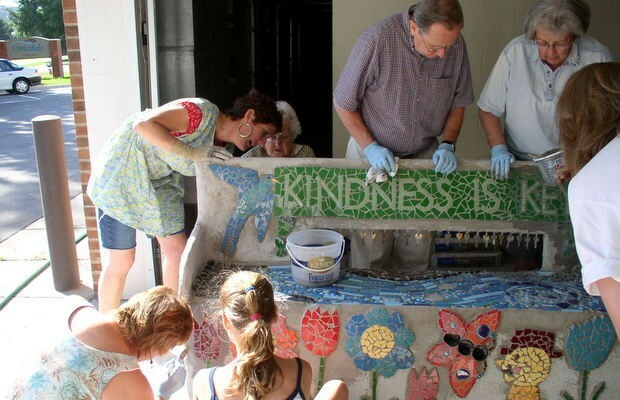 Many of the drawings made that evening inspired the mosaic designs that adorn the bench. Later, artist Sell led another evening project when the seniors and the girls created “memory jars,” an old folk art from the South. For young and old people working together, it was a way to share the parts of their lives that they remembered best. Gluing the objects to the jars was also an introduction to the art form that would consume their time while working on the bench. 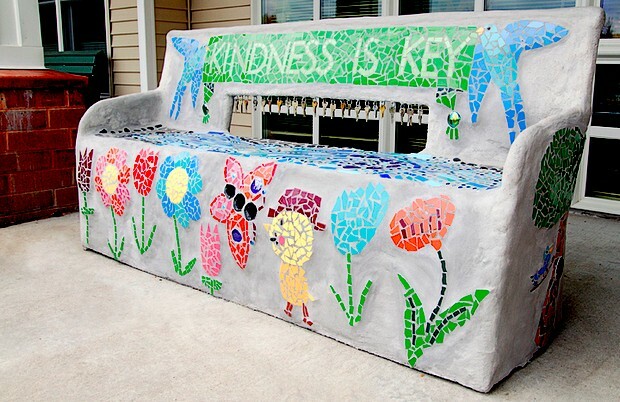 The ‘Kindness is Key’ bench features intricate mosaic, with tiny pieces of tile glued into patterns to form images. 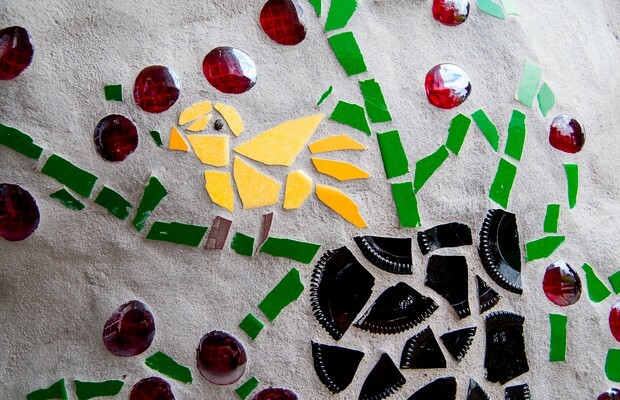 Sell enlarged springtime-inspired drawings by the Girl Scouts and used them as the pattern for the mosaic. Having recently studied a technique for building benches out of discarded wire chairs and cement, Sell retrieved some chairs sitting on a curb and used them to create the form of the bench, working in a garage at Croixdale that served as the project’s studio. Vern Hophan stirred a lot of cement, others helped pour water into the mix, and the bench took shape as cement was applied to the chairs. “It was necessary to get even the simplest tasks right,” says Edie Hophan. It was not a simple task to fill with tile the flowers, trees, butterflies, and splashes of blue flowing across the seat that represents the St. Croix River. The artists young and old spent many hours in the garage, finding just the right size and colored piece to fit into the puzzle. The group had all summer to complete the project, and usually worked one morning per week. Croixdale Recreation/Volunteer Director Mary Jo Ducklow recalled the low-pressure project, where everyone was welcome. “Residents from both independent and assisted living would walk down and help, or just visit, even if they weren’t working on it,” Ducklow says. To honor the history of Croixdale, which had recently torn down its old buildings and completed construction of a new facility, the bench incorporates all the old keys from the old building. When the bench was done, it was still in the garage. And it was heavy. Local window and door manufacturer Andersen Windows came to the rescue with a forklift one morning, and moved it to the front of the building. Edie Hophan says she sits on it frequently, and tells people its story. 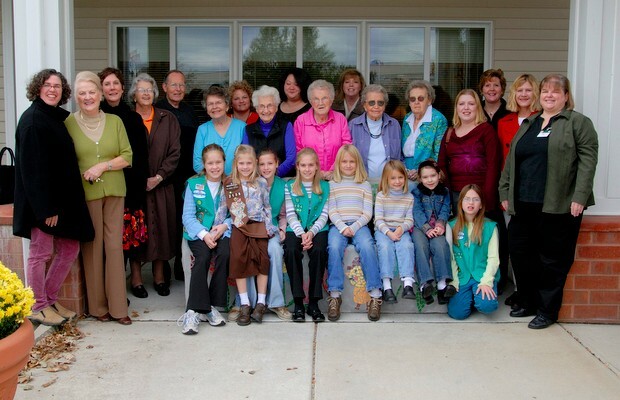 One winter day several years after the project, she said she was looking forward to some Girl Scouts coming over that night to play games with Croixdale residents. 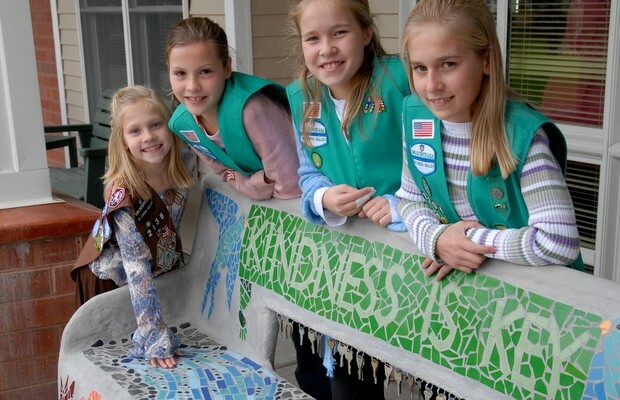 The mosaic images on this bench were inspired by drawings Croixdale residents and Girl Scouts drew together as they shared memories about spring. Bring colored pencils or crayons and paper and draw your own pictures as you share stories about the changing seasons. What do you remember seeing, doing, and feeling as winter turned to spring or summer to fall? Designed and created by Croixdale residents and Girl Scouts from troops #92, #515, #1204, #1610, and #2138 with Stillwater artist Judy Sell. In partnership with Croixdale, the Girl Scout Council of St. Croix Valley, The Phipps Center for the Arts, and the St. Croix Valley Community Foundation. Funded in part by Hugh J. Andersen Foundation, Croixdale, Metropolitan Regional Arts Council, St. Croix Area Youth United Way, St. Croix Valley Community Foundation, and South Washington County Schools, with in-kind support from Adolfson and Peterson Construction, Andersen Corporation, and ARKAY Builders, LLC.